With just a single click, you can do Argentin datum conversions or re-project entire files of coordinate data between Argentin coordinate formats. ExpertGPS supports all of the coordinate formats used in Argentina, including Argentina Zone 1, Argentina Zone 2, Argentina Zone 3, Argentina Zone 4, Argentina Zone 5, Argentina Zone 6, Argentina Zone 7, POSGAR 2007 / Argentina Zone 1, POSGAR 2007 / Argentina Zone 2, POSGAR 2007 / Argentina Zone 3, POSGAR 2007 / Argentina Zone 4, POSGAR 2007 / Argentina Zone 5, POSGAR 2007 / Argentina Zone 6, POSGAR 2007 / Argentina Zone 7, Chos Malal 1914 Argentina 2, Hito XVIII 1963 Argentina 2, Pampa del Castillo Argentina 2, UTM, and latitude and longitude. You can convert your GPS, GIS, or CAD data to any of these formats by bringing it into ExpertGPS and then selecting Change Coordinate Format... on the Options menu in ExpertGPS. Your data is instantly reprojected to the new datum and coordinate format. Even if your GPS doesn't support the coordinate grid format you use for a project at work, you can use ExpertGPS to seamlessly move your data between your GPS and your workstation, reprojecting the data on-the-fly to match the coordinate system you use in AutoCAD or ArcGIS. 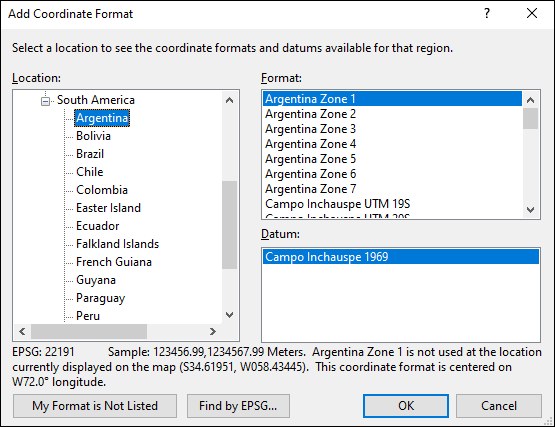 ExpertGPS also creates Excel CSV and Google Earth KML files so you can create reports or view your coordinate data over high-resolution aerial imagery and GPS maps of Argentina.